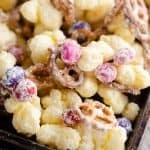 Sweet and Salty Puffcorn Snack Mix is an easy 4 ingredient recipe that only takes 15 minutes to make! 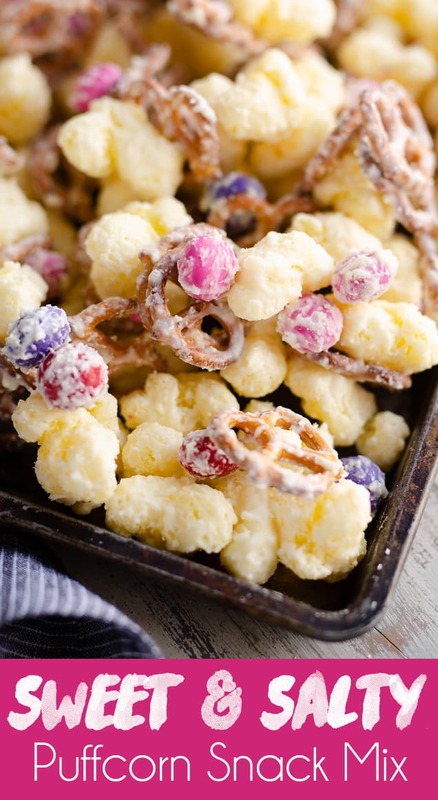 Puffcorn, pretzels and M&Ms candy are coated in white chocolate for a sweet treat that makes an amazing treat. 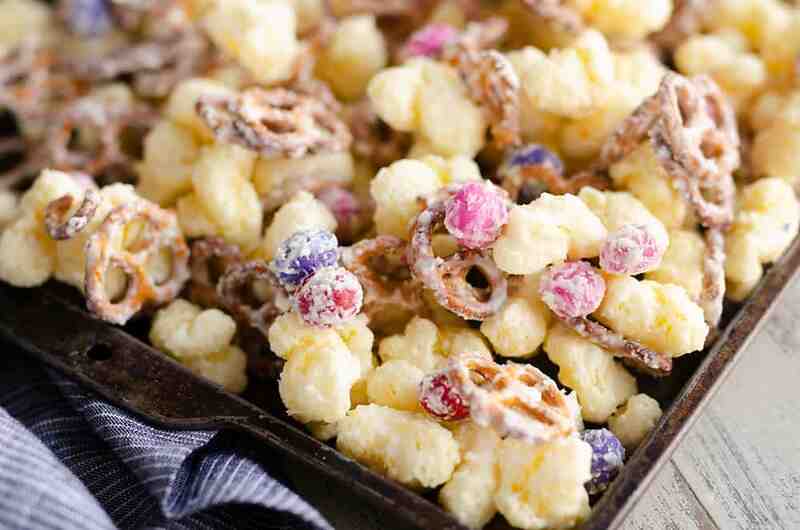 This Sweet & Salty Puffcorn Snack Mix is so good that it is insanely addicting! 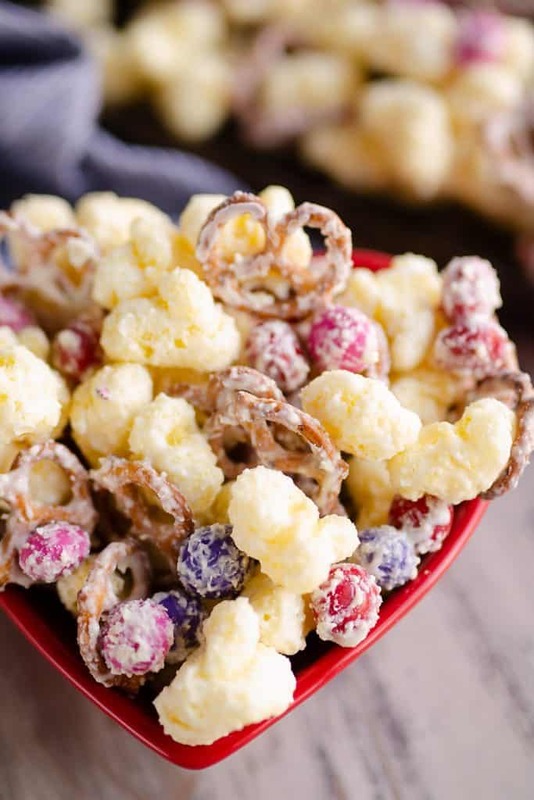 The combination of salty and buttery Puffcorn along with crunchy pretzels and colorful M&Ms all coated in a thin layer of white chocolate is to die for. 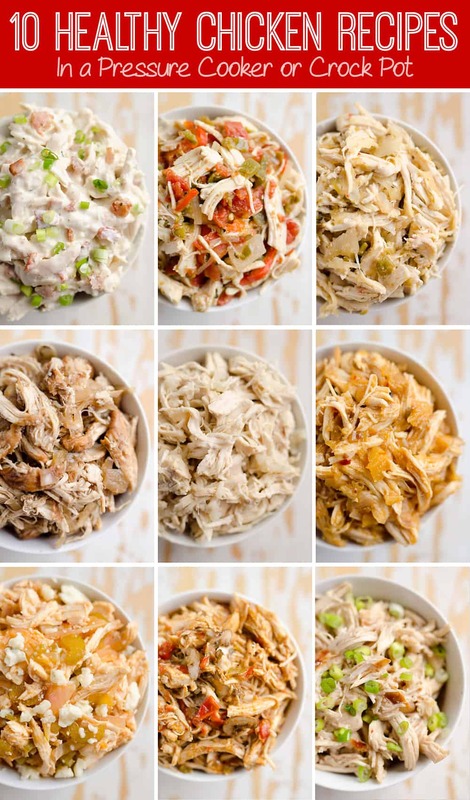 This easy 15 minute recipe only requires 4 simple ingredients and a couple minutes in the microwave. 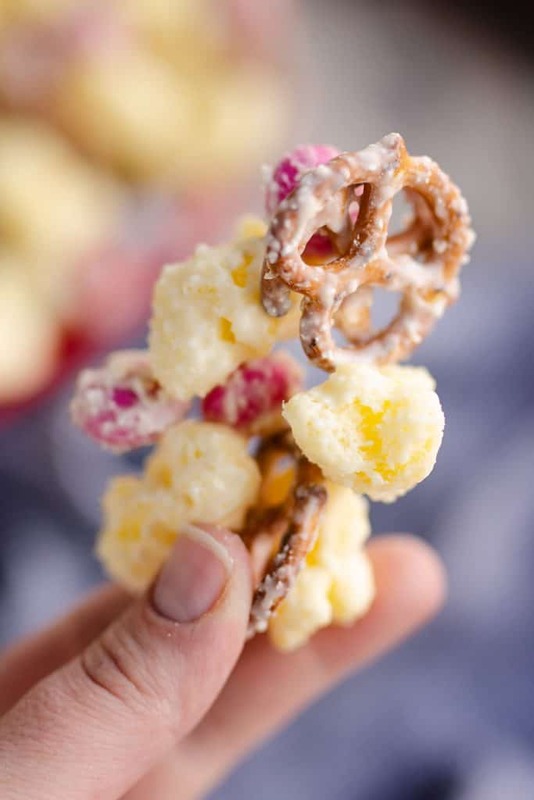 Puffcorn on it’s own is pretty awesome, but when you add the sweet twist to the mix it takes it to the next level, just like in this Honey Srirach Snack Mix. 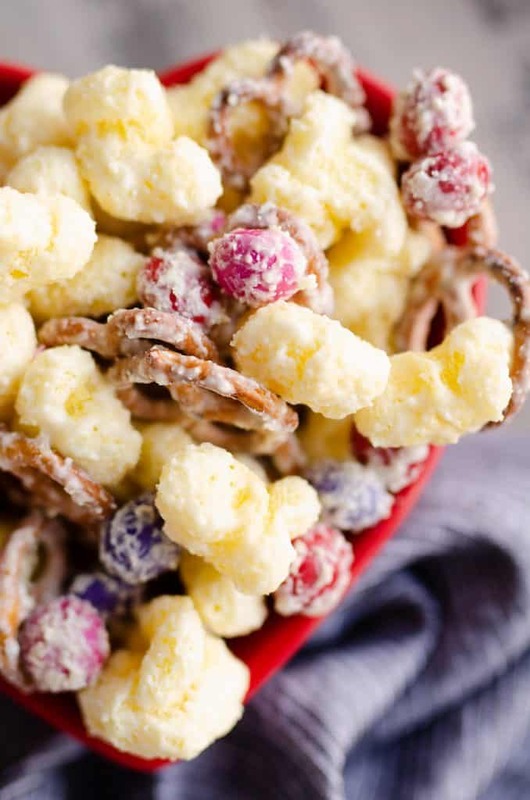 The best part about this Sweet and Salty Puffcorn Snack Mix recipe is that you can easily customize it for a fun holiday treat. Use the seasonal M&Ms to make the colors coordinate with the holiday you are celebrating. I opted for the Valentine’s M&M mix of pink, purple and red candy to make a sweet treat for a loved one. 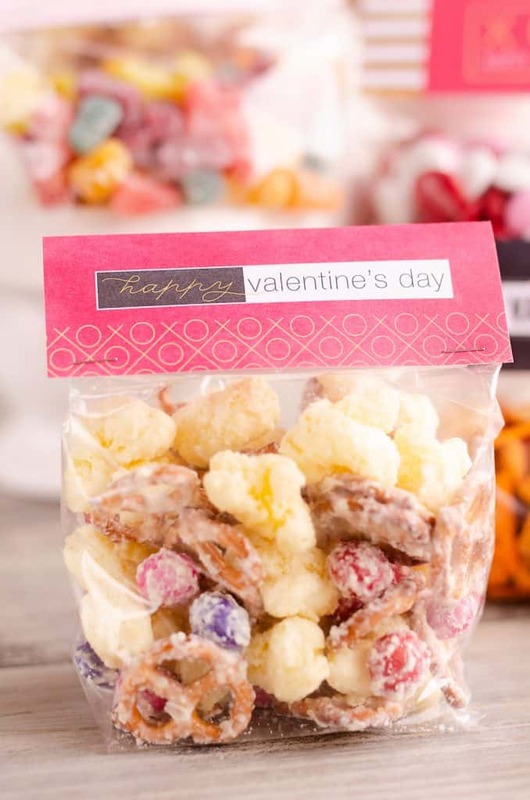 Put a bowl out at your holiday party or bag it up in cellophane treat bags for a thoughtful little treat. Check out these cool Free Printable Valentine Treat Bag Toppers for a special way to package up this easy treat for your loved ones this Valentine’s Day! Simply print out your favorite of seven different designs and attach them to the top of your clear treat bags. It’s a great way to personalize a gift for adults or children. 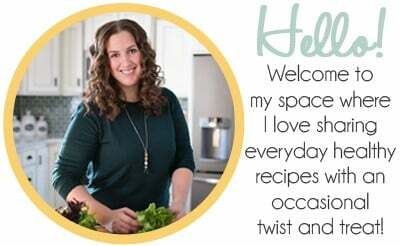 I use a huge Tupperware bowl to melt my chocolate in and then I just add everything into the bowl and toss it well until all of the salty snacks are coated in a thin layer of white chocolate. Layer some wax paper over your kitchen counter and spread the warm mixture out. Let it cool for 10 minutes and it’s ready to enjoy! 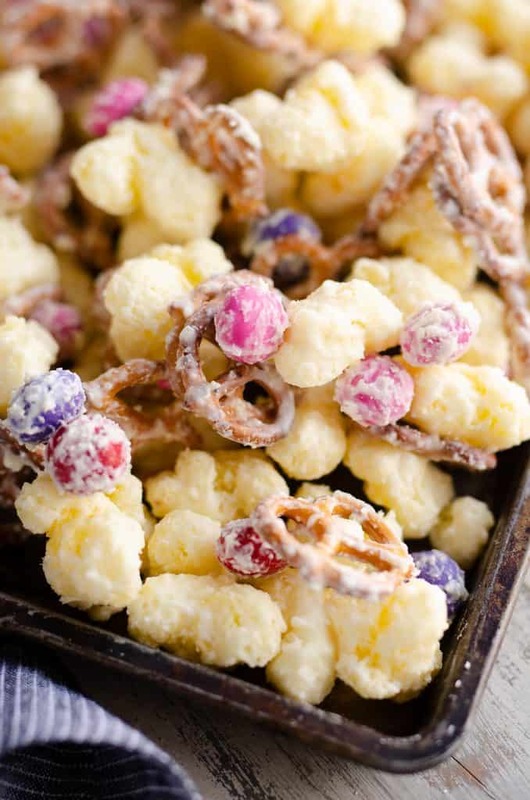 In a medium bowl, microwave the white chocolate chips for 1 minute. Stir and microwave 1 more minute. Stir until smooth. If there are still some chunks, microwave in 15 second intervals, stirring each time until the mixture is smooth. Be sure not to microwave too much or the white chocolate will become chalky. In an extra large bowl or roasting pan, add all of the remaining ingredients. Pour half of the melted chocolate on top and stir well. Add the remaining chocolate and stir until everything is well coated. Spread the mixture out over wax paper on the counter and let cool for 10 minutes. Store in an airtight container. 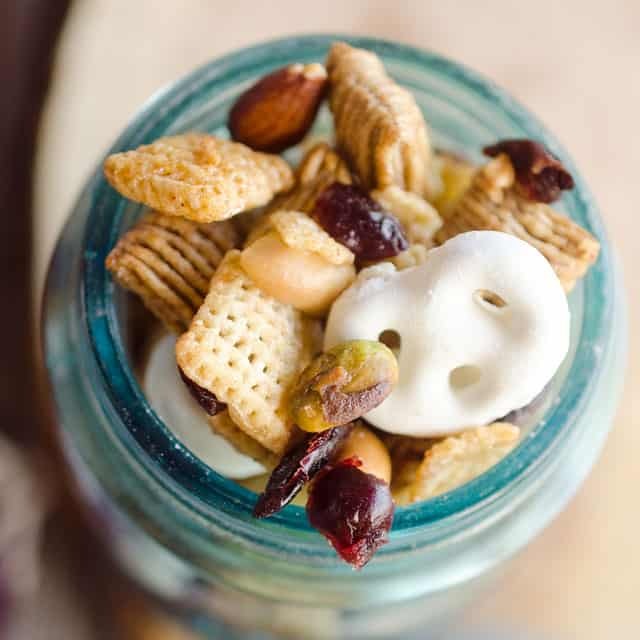 More sweet snack mix recipes! This is hands down one of my favorite treats!! Such a great recipe and so addicting! Puffcorn snack mix is the best! I can never stop eating it. Sweet and salty for the win! 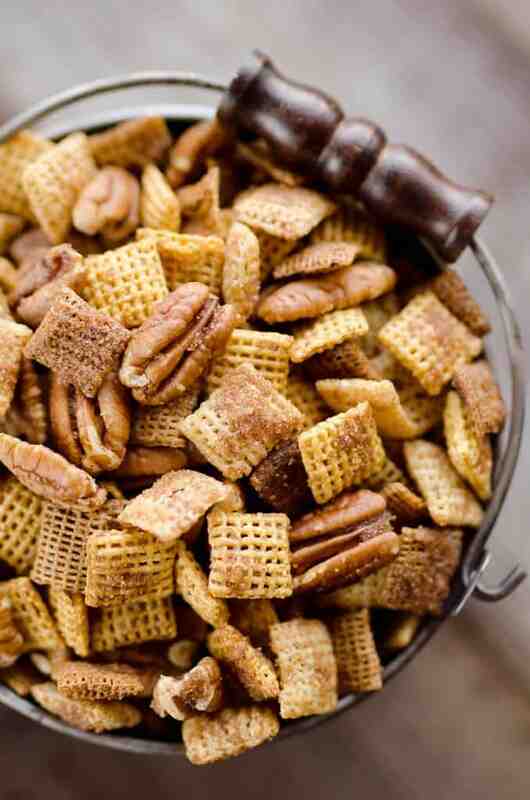 Love this festive twist on my favorite snack mix! I don’t know if I’ve ever even had puffcorn! I’m going to have to find me some! This looks so yummy!